The world of football is not noted for its eloquence, or its honesty. In interviews, players or managers – with the obvious exception of ‘the special one’ – resort to a well-drilled, endlessly recycled phrasebook, in thrall to club and/or country. It relies on humdrum mantras like these: ‘I’m happy with the result but it was a team effort and everyone deserves credit’ / ‘The opposition played well but we did what we had to and got a few lucky breaks’ / ‘Hopefully we can build on this result and turn it into a run of good form’ / ‘The fans were brilliant today and we did it for them’ / ‘The conditions were bad but we can’t have any excuses for the defeat today’… Etcetera, etcetera. The prevailing stance (or pretence) is that of the humble, wide-eyed schoolboy in a world of big people, always respectful and eternally hopeful of doing better next time. ‘Please sir, can we have some more goals.’ Of course, we all know this is just PR fluff, and it’s on the pitch that we see what they really think, mouthing four-letter words at the referee’s back and squaring up to the opposing defender like a rutting mammal in mating season. The same applies to managers, working themselves into a preternatural rage (and early heart condition) on the sideline. 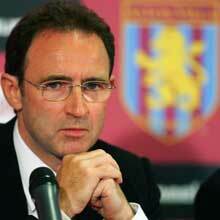 So kudos to Martin O’Neill for rising above the quagmire of cliché and telling it like it is. After he’d wisely ruled himself out of contention for the England job at one of those terminally dull press conferences, he was asked if he thought he would have made a good England manager.